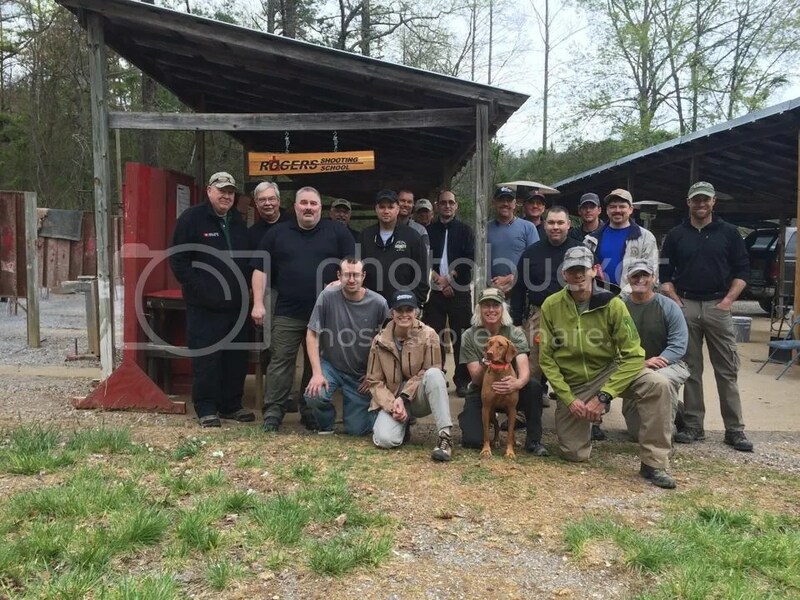 The Rogers Shooting School is one of the most prestigious shooting schools in the world. Some of the world’s most elite military and law enforcement units come there each year, and “The Test” is well known among the shooting community. I won’t go into a detailed explanation of The Test. Rather, click here to go to Todd Green’s site for an excellent break down and videos of each stage. A minimum passing score is 70 plates and earns a Basic rating. An Intermediate rating is earned by getting 90 or more plates, and an Advanced rating is earned by getting 110 plates. There are 125 total plates possible in The Test. During my trip to Rogers, I was witness to a memorable event in shooting history. Now in its third decade of operation only two people had ever shot perfect scores on The Test. The founder, Bill Rogers, has done it twice, and the legendary Rob Leatham has done it once. In my class, two perfect 125s were shot. One was by Gabe White, and the other was by noted USPSA shooter Manny Bragg. If that wasn’t enough, Gabe White did it shooting from concealment. I think the best way to describe Rogers is that it forces the shooter to maintain a strong mental focus. Any lapse leads to a cascading collapse of fundamentals and numerous steel plates taunting you as they drop out of sight. I am happy to report that I earned an Advanced rating. Participants in the class came from as far away as Alaska. We also had participants from Colorado, Oregon, Utah, Indiana, California and Florida. We had a full gamut of weather from short and t-shirt weather on Sunday evening followed by rain on Monday and Tuesday to freezing temperatures on Wednesday and a beautiful day on Thursday. We managed to finish on Friday before another round of rain hit. A very insightful comment. The pacing of battle and the necessity to be able to ramp one’s mental focus up and down are not often spoken about. When I watch videos of battles in Afghanistan, I’m frequently struck by how similar the pace is to the Testing Program at Rogers. A flurry of activity, followed by an operational pause, and then repeat. Since the Testing Program has nine components, each being shot by the entire class, usually in three relays, it’s shoot, reload, observe, and then repeat; nine times in succession. The process takes 1-1.5 hours each day, twice on Thursday. It’s nerve racking and as mentally demanding as it is technically challenging. Congrats on the Advanced Rating. Two 125’s. How ’bout that! Impressive to say the least. I’ve shot advanced but can’t seem to ever make up those last few shots. Looking forward to another trip this fall for the rifle class.